Unlock the power of radiance with Clé De Peau Beauté’s new beauty combo, the Enhancing Eye Contour Cream Supreme and Vitality-Enhancing Eye Mask Supreme. As the therapist gently places the Clé De Peau Beauté’s new Vitality-Enhancing Eye Mask over my eyes, my relaxed state of mind starts to wander far and wide. How much my skin’s need has changed over the years! In my teens and 20s, acne and breakouts were a major concern. Now in my 30s, as the first signs of aging start to appear around the eyes, I am freaking out. And the never-ending beauty quest for firming and hydrating skincare products has begun. When beauty brands drop their newest scientifically-proven sensations, I’m almost always sold. Beauty launches are the bee’s knees! With continuous use, the appearance of wrinkles and eye bags are visibly reduced while the eyes look brighter and more energised. 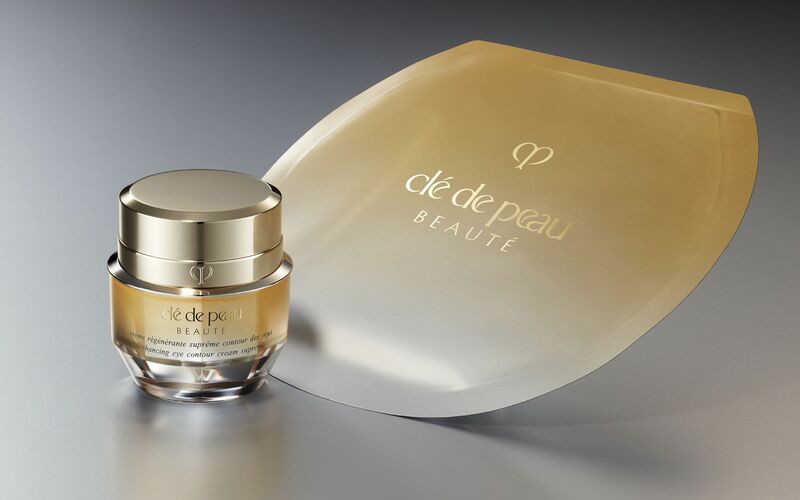 Enter Clé De Peau Beauté’s new beauty combo, which comes sealed with a promise for radiant eyes in a jiffy. Thanks to an intense, scientific approach backed by research and more research; the Enhancing Eye Contour Cream Supreme and Vitality-Enhancing Eye Mask Supreme want to be a mainstay in your beauty kit. The star ingredient in both, the Iris Florentina Extract was six years in the making through careful cultivation and extraction process. This precious essence is extracted from the Iris plant that thrives in extreme conditions and is widely used in perfume-making, but it is its ability to offer moisturising, regenerating and anti-aging benefits that sealed its fate with Clé De Peau Beauté. If you want to anti-age your eyes, these simple and soothing steps – as demonstrated by the brand’s trained beautician – will help you meet the aging problem eyeball-to-eyeball. Apply the cream at the end of your beauty routine at night or use it in the mornings before the sunscreen application. Use the platinum-coated, custom designed tool to take a small amount of eye cream and dot it above and below each eye. Smooth it upwards and outwards using the third and fourth fingers, as that’s where the touch is the gentlest. Eye-stimulating exercise - open eyes wide and hold for 5 seconds, then slowly lower the eyelid until it is half closed. Hold for 5 seconds and repeat step 1 & step 2. Under-eye bags - glide the tool below the eye, from the inner corner outward. Repeat six times. Fine lines, visible wrinkles and drooping at the outer eye corners - gently massage in small circles, working outward toward the temple. Repeat three times. Puffiness - lightly press the tool beneath the eyebrow, close to the bridge of the nose. Follow the brow and circle the eye completely, returning to the starting point. Repeat three times. Eye fatigue - gently press along the outside corner up to the temple, repeat three times. The Vitality-Enhancing Eye Mask Supreme is indulgent and effective in restoring the skin around the eyes. Finally after the cream has settled nicely on the skin, remove the Vitality-Enhancing Eye Mask Supreme from its packet and gently place it over your eyes. Leave it on for about 10 minutes and then gently lift the mask off. Massage the remaining essence gingerly into the skin. Once the beautician was done with the final step, it sure felt like I was looking at things with “fresh eyes”. It was a relaxing ritual and also rejuvenating at the same time. Do this twice a week and within two months and you will see improvements in fine lines, puffiness, dark circles and overall hydration & moisture; as proven through a study done on over 100 Asian women aged 40s to 60s within a period of two months. Check out the #3WeeksOfRadiance video below, featuring Elizabeth Lee, Teo Yi Ping, Reem Shahwa, Kelvin Koh, Emmy Agung and Desmond Tey. The eye cream and mask are now available at Clé de Peau Beauté, Pavilion KL as well as at Isetan KLCC, Parkson Gurney Plaza, Robinsons The Gardens Mall and Parkson, Pavilion KL. Stay up-to-date with their latest offerings by visiting their website here. For healthier eyes, don’t forget to also get a good night’s rest!